1. Rub the turmeric powder and salt on the fish and keep aside for 10 minutes. Then rub the mustard paste and lay the fish out in a round dish with a tight-fitting lid so that it can be put in the pan where the rice is being boiled for cooking. 2. Bring 4 cups water to the boil and add the rice. Bring back to the boil and then lower heat and cook covered until the rice is half cooked. 3. 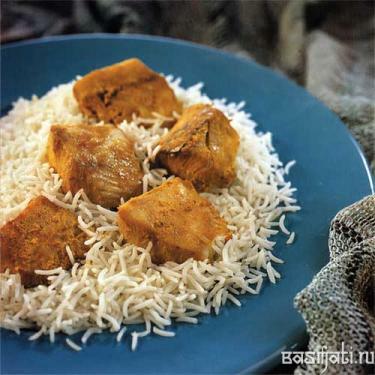 Place the round dish with the fish filets in the centre of the rice, cover and cook on very low heat for another 5-6 minutes or until the rice is done. 4. Remove from heat and carefully remove the round dish. 5. Serve the cooked fish with the rice.